Ducks Unlimited Canada has numerous walking trails, two of which are located just south of Prince Albert. A brochure entitled “NATURE WATCH Wildlife Viewing Opportunities from DUC” is available at Tourism Prince Albert. 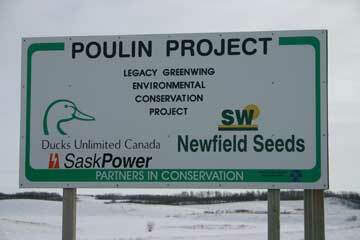 The POULIN area is 11 km south of Prince Albert on Highway 2. The Parkland Oasis Nature Trail, 2 km long, starts at the parking lot. The ROYLE area is 5 km southeast of Prince Albert on Highway 3. Take the Davis road to the south for about 1 km where there is a turnoff and a walking trail.